It will be surprising for you to know that you used Machine Learning (ML) to reach this blog through Google search! This makes a case strong to learn Machine Learning Skills. Of course, those skills are interesting! Furthermore, you unknowingly use Machine Learning in your daily use devices. “Alexa, ask Domino’s to feed me”; “Ask Domino’s to track my order”; Alexa, ask Domino’s where my pizza is”. Finally, you get the Pizza and munch every juicy piece of it. Alexa, your personal assistant helps in getting the pizza. Significantly, Amazon Alexa uses Machine Learning. Here ML collects your information and gives relevant information based on your previous activities. How does your Uber cab App give you the exact price to reach a place? How are the routes determined and minimized in UberPool? Markedly, all of this is solved with the help of ML. Yeah, yeah this is a big issue you would nod. You hear lot of news about a particular event per day. Out of that which is fake and which is real? To know this, in Machine Learning you have something called as Classificationbox. Significantly, this classifies real news and fake news. Have you seen Facebook (FB) suggesting to you, “People You May Know”? Importantly, FB studies your activity with the help of ML and suggests to you people whom you can make friends. Have you come across “Similar Pins” on Pinterest? Pinterest gives you similar suggestions based on your liking and interests. This is possible with Computer Vision which uses Machine Learning. Now you would have got a feel of what Machine Learning really is. It’s time to move forward. All of this sounds interesting, right? What if you then really get good training in Machine Learning? What if you know the secrets of how ML is used across various devices and machinery? Come on! It’s high time you leave your old mechanical job and get to do something creative and innovative. Get trained in Machine Learning skills. As of April 5, 2019 there are 7062 job vacancies in Machine Learning listed in Naukri job site. Similarly, job search site Indeed lists 108 Machine Learning jobs. Likewise, LinkedIn lists on the same date, 323 ML jobs in Chennai city alone. 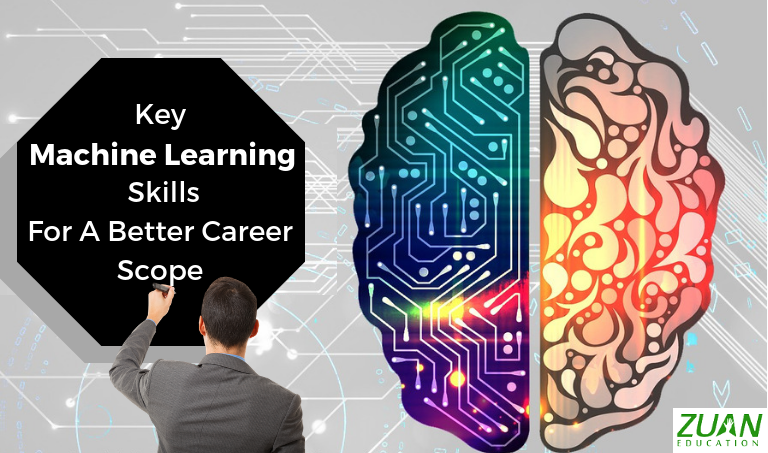 What Machine Learning Skills Will You Learn in Machine Learning Training Centers? First of all, don’t panic about learning key skills in Machine Learning. The skills required to learn in the Machine Learning course and the Machine Learning syllabus is simple to master. Particularly, Machine Learning course in Chennai institutes also guide you to get globally recognized certifications in Machine Learning. Furthermore, this is provided apart from the course completion certificate that you will get. Now what are those interesting skills that you will learn? You will be groomed in basic Math, Data Science, and Engineering skills. Furthermore, training in handling Probability is given. This is because most of the Machine Learning algorithms deal with uncertainty and making reliable predictions. Significantly, relevant training in Statistics such as analysis of variance and hypothesis testing is also given. Particularly, you will learn the science of Data Modeling. Additionally, gaining Programming Skills will be another priority. Markedly, practical lessons will be taught on Machine Learning Using R.
As a data scientist and Machine Learning Engineer, you will also learn signal processing techniques. You will also have the opportunity to learn the essential use cases of Big Data. Using Machine Learning for your business will be helpful to get ideas from huge chunks of data. Furthermore, you can develop your business with these ideas. Markedly, the use of different programming languages such as Machine Learning with R etc, and other storage and computational processing has made analyzing data easy. Significantly, with the help of ML you can deliver personalized services and differentiated products that serve various customer needs. With the help of Machine Learning, you can also identify opportunities that will be profitable in the long run. Machine Learning Engineer: You get paid an average of Rs. 815,000 per annum. Data Engineer- As a Data Engineer you will be paid Rs. 510,000 per year. Data Architect- The average salary you will get in this job role is Rs. 1,809,898 per year. Data Scientist- Rs. 620,244 per year will be your average salary. Data Analyst- Your average salary will be Rs. 370,000 per year. More than 50,000 jobs are lying vacant in the field of Machine Learning. The vacancy is due to the lack of skilled Machine Learning professionals. You can be the one to grab a job by getting trained in Machine Learning. Best Wishes For Your Learning and Placement In a Job!